Hytera is proud to launch the PD7IS series, two new intrinsically safe handheld digital mobile radios (DMR), expanding the current Atex range. Certified with the highest possible ATEX security class "ia", the PD715IS and the PD795IS provide maximum user safety in potentially explosive areas. The PD7IS series expands the innovative DMR range of handsets designed for use in potentially explosive work environments. Meeting the stringent ATEX directives of the European Union, FM standards and IEC standards, these two devices are also IP67 rated producing a robust and reliable solution for use in harsh environments. 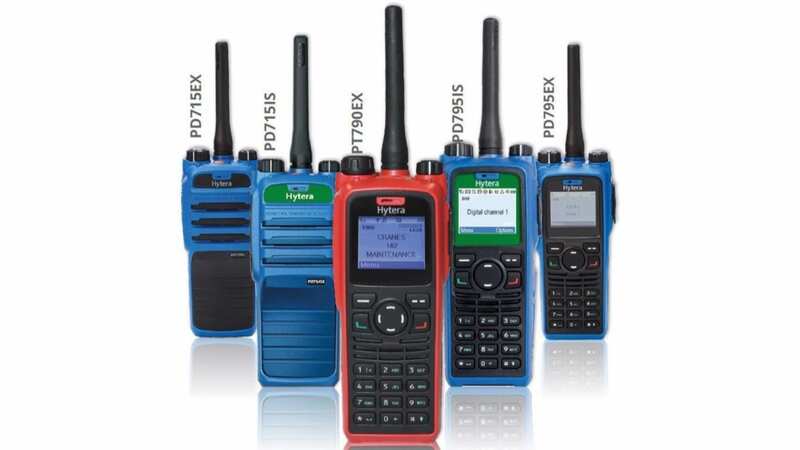 The PD715IS and PD795IS are unique on the DMR radio market. Both handheld radios attained the maximum ATEX security class "ia" in the three areas of gas protection, dust protection and protection for use in mining. These two-way radios are the first DMR handsets that are authorised for use in areas with the highest level of protection, from Zone 0 for gas and Zone 20 for dust. "Last year, we brought our PT790Ex TETRA radio to market, which was also certified with the highest ATEX security class. This year, we are expanding our extensive DMR intrinsically safe range with the PD7IS series, maximising user safety and efficient communication in some of the toughest work places" says Robert Green, Marketing Manager at Hytera UK. Like all Hytera radios, the radios in the PD7IS series offer outstanding design properties and a broad range of functions including GPS as standard. The radio series consists of two devices: The PD715IS without a keypad and the PD795IS, which has a full keypad and shatterproof screen. The mechanical design with multiple levels of safeguarding, protects the user from incorrect use and ensures there is no chance of creating an ignition. For example, an alarm sounds automatically if batteries and accessories that do not meet the required level of protection are used. The PD7IS devices can be operated either in analogue, DMR Tier II, DMR Tier III and in MPT, XPT or in single-frequency networks. Matthew Napier, Sales and Marketing Director at Hytera UK comments, "The PD7IS radio series expand on our market leading range of solutions for the oil, chemical and gas industries, also providing the highest level of saferty fo specialist mining and emergency service requirements. Workplaces which handle combustible and explosive gases, liquids and dust place especially high demands of reliability on secure communication. As an innovation leader in the DMR market, we are therefore proud to have achieved the highest possible ATEX security class "ia" with our devices, coupled with the extensive functionality, build quality and audio clarity you can expect from all Hytera devices." To view the full range of Atex handsets and download product brochures please click here.